The Vancouver Canucks will soon add some much-needed depth to their organization, with four of the top 64 picks in the upcoming NHL Entry Draft draft. In my last two articles, I looked at options for the Canucks at fifth overall, and at 33rd overall. I took one centreman and one defenceman, so there’s some flexibility here with the 55th overall pick. The Canucks will pick soon after this at pick No. 64, so some of the five players available could fall to the Canucks nine slots later. I tried to select players that are ranked below 55th overall, but some of these players could be gone by the 55th selection. With a mix of mobile defenders and offensive prospects with a high ceiling, here are my five choices for 55th overall and perhaps 64th overall as well. My choices are ranked from the fifth-favourite selection onwards, with my top choice being the final player on this list. Perhaps the Canucks haven’t had the best luck in selecting B.C. boys, but that shouldn’t deter them from considering Jarret Tyszka. His vision and hockey IQ combined with good mobility for his size should have him on the Canucks’ draft radar. 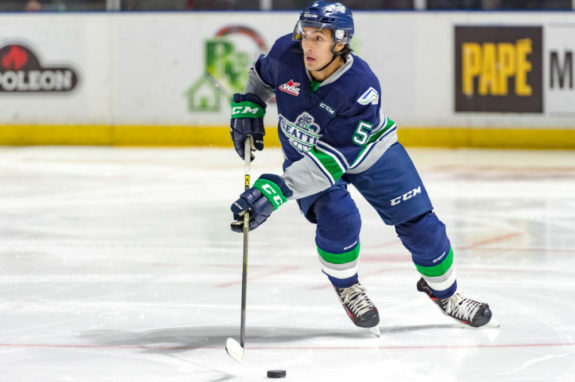 Tyszka played for the WHL Champion Seattle Thunderbirds this season. He was arguably the team’s best defencemen behind Edmonton Oilers draft pick Ethan Bear. The fact that Tyszka played no small role in Seattle being crowned WHL Champions should bode well for him on draft day. The reason Tyszka isn’t ranked higher on this list is that he’s a safe choice. He doesn’t have a lot of flash in his game, but he’s an overall solid defenceman with modest offensive contributions. Bear is eligible for the AHL next season, so Tyszka has the chance to become the Thunderbirds’ number-one defenceman. The player who was defined as the steal of the 2017 draft is likely available for the Canucks at 55th overall. Markus Phillips had an outstanding 2016-17 season, and perhaps it’s surprising that he isn’t ranked a bit higher in most draft rankings. Phillips was Team Captain for Canada at the U-18 World Championships earlier this year. 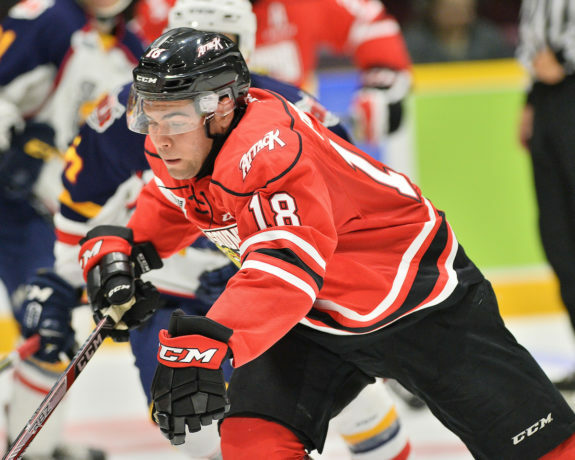 Although he endured a bit of a slow start for the Owen Sound Attack, Phillips finished with 13 goals and 41 points in 66 games. He wasn’t as productive in the playoffs, but he’s rounded out his overall game as the season has progressed. He has decent size, good speed, and good offensive instincts. The main thing he needs to do is cut down on turnovers, something he improved on as the OHL season progressed. 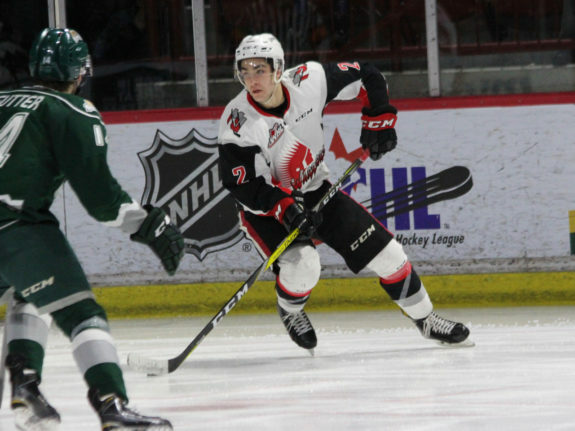 Josh Brook improved as the season went on for the Moose Jaw Warriors, which should have his stock rising ahead of the draft. Brook has similar attributes to Tyszka. He’s an all-around great defender who doesn’t necessarily excel in one area. The main difference is that Brook has a higher offensive ceiling than Tyszka. Brook had 40 points in 68 regular-season games while Tyszka had 25 points in 54 games. In the playoffs, Brook stepped it up with seven points in seven games while Tyszka had seven points in 20 games. 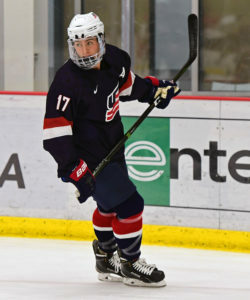 Brook has patience with the puck, he’s composed, skates well, and has promising size. He checks off a lot of boxes and is a steal at either 55th or 64th overall. While there are some good defensemen available later in this round, I would argue that the Canucks still have a pressing need for offensive-minded players with higher ceilings. These last two prospects, including Evan Barratt, fall into this category. Barratt is another fantastic centre to play for the United States National Development Program. Although he’s no Auston Matthews or Jack Eichel, Barratt is a solid two-way centre with excellent playmaking abilities. He was the United States’ second-line centre behind Josh Norris on a squad that won gold. The knock on Barratt is size, but at 5-foot-11, 187 pounds, he’s no slouch. He also has a tendency to pass instead of shoot. His playmaking ability is good enough for the NHL, and his two-way ability makes him a strong bet to become at least a middle-six player at the NHL level. Ostap Safin has the tools to become a top-six player at the NHL level, and his high ceiling makes him my choice for the Canucks at 55th overall. In THW’s Mock Draft for Round 2, Safin was my selection, with none of the players I’ve listed above coming off the board. The 6-foot-4, 198-pound native of Prague has tantalizing skill along with his size. He has a great shot and is a puck-possession beast. Safin is an above-average skater and he maintains puck control at top speed. The benchmark for players like that is Connor McDavid. Although Safin is clearly no McDavid, a combination of solid puck handling blended with speed is necessary in today’s NHL. Where Safin does lose some marks is in his creativity on the ice. He’s more of a north-south player and lacks that dynamic ability to make plays. That and the fact he played limited minutes in the Czech Republic’s top league are likely the two factors keeping him from being a first-round pick. He plays a 200-foot game and produced in the Czech Republic’s top league despite limited minutes. The Canucks need players with a high offensive ceiling, and Safin fits the mold. There is a good stable of prospects in Vancouver, but a lack of players with elite potential. That especially applies to elite prospects with size. Safin is a bit of a risky pick. He’s played limited minutes against men, but his skill set has him deserving of a bigger opportunity. If the Canucks give him that opportunity, there’s a chance Safin could flourish in this organization.